I bought this $5 paperback at Powell’s Bookstore, the largest independent bookstore chain in the world. I read the whole thing, cover to cover, sitting in the Portland Rose Garden and then pedaled back to my hostel on a bright orange Biketown bike. I learned from this little book, and by spending a long weekend in the small city, that Portland is a happy place full of optimistic people. Here, I will share with you my Portland recommendations in the hopes that you’ll love it, too. I am not exaggerating when I admit that I went to Pine Street Market five times during a four day trip. Pine Street Market is a food hall and the location that I frequented is in the Pearl District. It was basically my home base. The first time I went was on Friday night with my Federal Hill neighbors who happened to be in Portland that weekend, too. We enjoyed Ramen and then Salt & Straw for dessert. The place was packed for a Friday night, but it was filled with an inviting atmosphere. Naturally, I went back four more times for an Acai Bowl (Kure Juice Bar), a Chai (Brassbar Portland), a Salad + Juice Shot (Kure Juice Bar), and a Choco Taco (Salt & Straw). Great location, home away from home. It’s important to note that I indulged in dessert or donuts everyday while in Portland, so I’d like to take a moment to unpack the sweets scene in this city. For starters, everyone told me that I had to go to Voodoo Donuts. I’m going to be honest here, and these are fighting words: I wasn’t very impressed. Yes, I probably ordered wrong. Perhaps the vegan donut was a huge misstep on my part, but I wasn’t in favor of the entire experience: long line, snarky atmosphere, lots of cereal piled high on donuts revolving around behind glass. I just wasn’t feeling it. I knew I had to visit another donut shop to try a different experience. 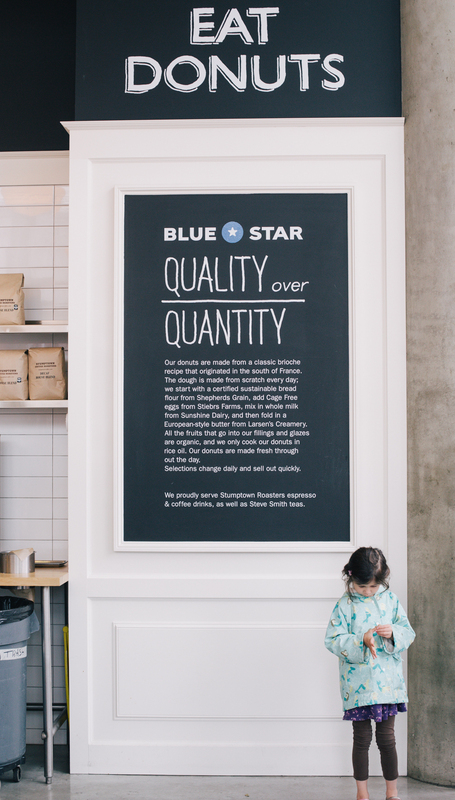 Enter: Blue Star Donut. I went to Blue Star Donut on October 10 and have thought about the experience at least a dozen times since then. I ordered the Passionfruit Cocoa Nibs only because I was so overwhelmed by all of the unique choices, I asked them to surprise me. Just look at the description: Our signature brioche ring is brightly glazed with the sweet and tart flavor of passion fruit, and playfully kicked up with a dash of Cayenne. Roasted cocoa nibs (bits of cacao or chocolate beans) are sprinkled on top to balance the flavors with a touch of crunchy bitter chocolate. This donut will literally make your mouth water while you’re eating it! Yes, my mouth is currently watering. I loved this chalkboard. It just felt to me that Blue Star Donut was the grown up option donut option in Portland. The culinary masterpiece. It was so good. In addition to the donuts, I had a great deal of ice cream. Yes, Salt & Straw was great, but let’s talk about Ruby Jewel. Their ice cream sandwich was AMAZING! I chose two different cookies and two scoops of ice cream, just to go the extra mile. I should’ve considering focusing more, because it was a bit extra: Top- Oatmeal Chocolate Chip Cookie, Bottom- Chocolate Chip Cookie- Scoop 1 Honey Lavender Ice Cream + Salted Caramel Ice Cream. Oh my! Moving on from the sweet stuff, I loved grabbing a casual lunch at Elephants on 22nd before shopping on NW 23rd street. It was a cute deli/market with everything (pizza, soup, salad, sandwiches, prepared foods, etc), so it would be a good spot to take a group. They also had a lot of unique gifts and gourmet food items that would make great souvenirs. I love fast casual healthy spots, so Love Joy Bakery and Prasad were perfect for a quick and relaxed breakfast and dinner, respectively. I discovered Oregonic Tonic at Love Joy Bakery after a sweaty Barre3 class. They had all day breakfast, egg sandwiches, house-made granola and avocado toast. Prasad was similar, and the location I went to was within a yoga studio. I ordered a Buddha Bowl and tea. If you’re in the mood for a dimly lit, less casual restaurant, Bamboo Sushi was incredible. They’re all about sustainably caught, humanely raise, naturally grown seafood. We let the bartenders curate our experience, and that was definitely the best way to go. Everything they brought out was prepared impeccably. Great ambiance! In addition, Noble Rot, a 4th-floor wine bar with small plates from their rooftop garden, was fantastic with Alice Waters vibes. Portland is super easy to navigate, and you can get around much of the city on foot or via bikes. My friend Cara and I walked 12 miles in one day between eating, shopping, hiking and just exploring the city by foot. We hiked and stretched at The Yoga Space. We also took a Barre3 class in the Pearl. After I had listened to Founder Sadie Lincoln’s “How I Built This Podcast”, I basically decided that I should go to Portland… so I had to do the class. It was great and we had avo toast at LoveJoy Bakery after. Shopping isn’t usually a high priority for me, but Portland shops won me over. Aside from the Portland Saturday Market, which is great to explore for eats and gifts, I loved wandering around NW 23rd street. I bought some great cards from Tender Loving Empire, an awesome dress from Crossroads Trading Co, treats for Winnie at The Hip Hound and a succulent sweatshirt from Buffalo Exchange. My favorite shopping experience was definitely Powell’s Books. I bought 4 books, half a dozen cards and spent over 2 hours browsing. You could spend an entire day there getting lost-- the store took up an entire block! I stayed in two places: first, a hostel with my friend Cara for three nights. It was better than barebones, and I loved the cafe connected to the hostel. Everyone was friendly and it was located in the Alphabet District, with easy access to the Pearl. If you prefer a hotel setting, stay at the Mark Spencer Hotel. It was lovely and I recommend it if you’d like to stay in the Pearl.